Indiana’s Religious Freedom Restoration Act dominated headlines last week and garnered national media attention. In response to the law, corporations, organizations and other state governments announced they wouldn’t work with Indiana if the law remained intact. 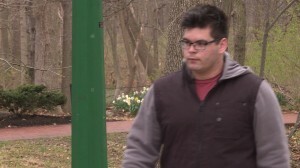 The portrayal of Indiana in national media also affected the decisions of a more impressionable group of outsiders: high school seniors from other states considering Indiana colleges and universities. Almost every day this month, hundreds of prospective students will visit Indiana University’s campus. They either recently committed, or are trying to get one last feel for the university before choosing a school by the May 1 deadline. Liam Dixon is one of those students taking an April campus tour. He applied to 18 universities and has spent the majority of his senior year at his home in Irvine, Calif. trying to decide which one is the best fit for him. He recently settled on IU. Around the same time he committed to IU, the news of Indiana’s religious freedom bill reached Dixon in California, where he goes to school with openly gay students and lives in what he calls a very open-minded community. “I didn’t know how to interpret hearing they were being so close-minded and conservative on this on specific topic,” Dixon says. Dixon wasn’t the only out-of-state student to question his decision about spending the next four years in Indiana after reading about the law. The Admissions Office at IU received multiple calls and emails from out-of-state students and their families. 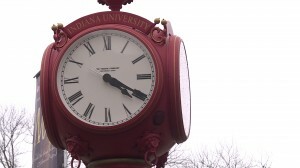 Thieme says although the concurrent timing of the commitment deadline and RFRA was unfortunate, it helped engage prospective families with IU and learn even more about the university. There’s an old phrase, nothing’s sure in life except for death and taxes. We could probably make an argument for standardized tests as well (even Harry Potter took an annual exam in his mythical, made up school year). 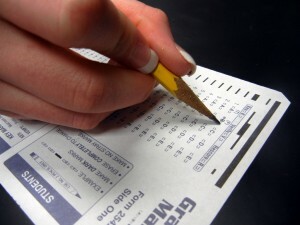 These tests carry important consequences for teachers, schools and students, and in Indiana this year, students will take a new version of the state’s standardized test, the ISTEP+. Simply put, the test will be harder. The content of the questions is the same, but the format will look different. For one, there won’t be as many multiple choice questions. Another change is that students will have to explain how they got to their answer. Why are we changing the test? 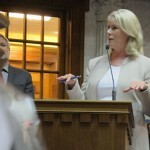 When Indiana passed its own academic standards this spring, Michele Walker, Director of Assessment for the Indiana Department of Education, and her team were charged with creating a test to match the new standards. An assessment matching the new standards was also a requirement to receive a No Child Left Behind waiver extension. 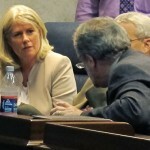 CTB/McGraw-Hill president Ellen Haley confers before a meeting of the Indiana Commission on Education on Friday. 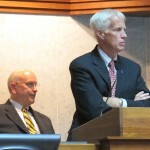 From left, CTB/McGraw-Hill president Ellen Haley, chief digital officer Stephen Laster and vice president Richard Patz stand before an Indiana Commission on Education hearing on June 21. Indiana House Education Committee Chair Bob Behning, R-Indianapolis, leads the meeting of the Commission on Education as Senate Education Committee Chair Dennis Kruse, R-Auburn — the commission’s co-chair — sits in the background. CTB/McGraw-Hill president Ellen Haley addresses the Indiana Commission on Education. The testing company executive answered lawmakers’ questions about what went wrong with the exam and apologized for the disruptions. 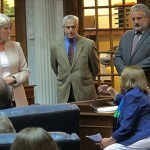 Apologetic executives from the testing company whose servers overloaded twice — interrupting April’s online ISTEP+ exams twice — told the combined membership of the Indiana House and Senate Education Committees that they took responsibility for the errors. 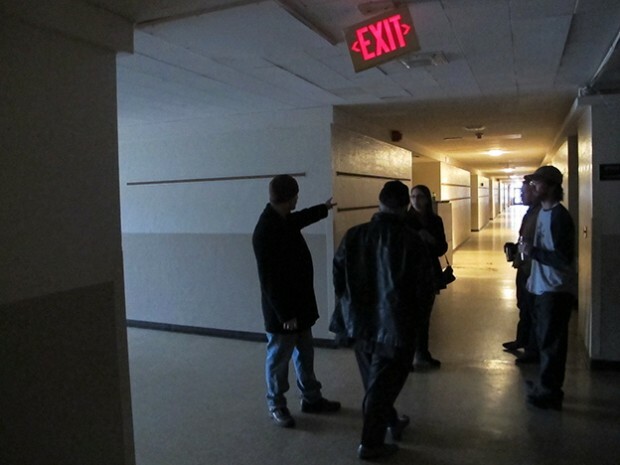 Matthew Brooks points down the hallway of an old school building in Indianapolis in which he and other Project Libertas leaders are considering renting space next year. Project Libertas, a private, non-accredited school formed by charter school the Indianapolis Mayor's Office shut down last summer, is currently renting space in a church-owned gymnasium just northeast of downtown. 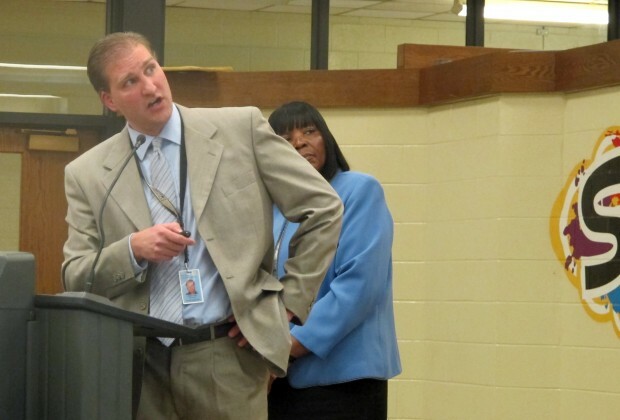 The ink was barely dry on a legal decision that sealed fate of The Project School — Mayor Greg Ballard had ordered the Indianapolis charter school to close — when some of the school’s staff declared they would still hold classes this year, charter or not. And about 20 defiant families have done just that. The school they’ve opened, called “Project Libertas,” has very little money. But with about 35 students in Grades K-8 and a small staff of former Project School hands, the parents are now seeking a more permanent home. Newly-elected state superintendent Glenda Ritz took the oath of office before a crowd of hundreds of supporters and statewide dignitaries in the atrium of the Indiana Statehouse Saturday afternoon. 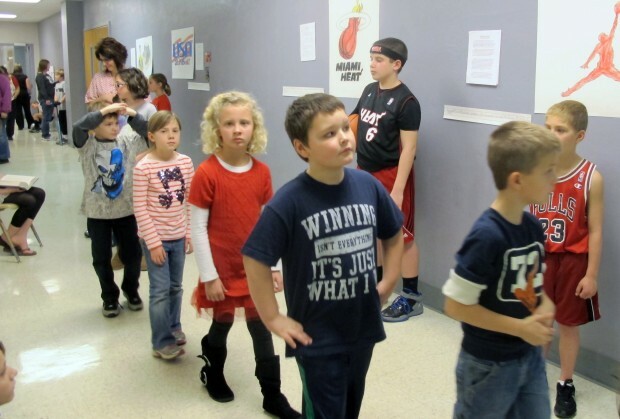 Younger students walk through the halls of Rockville Elementary School as fifth graders portray famous historical figures. The students can't talk or interact with their parents or peers while part of the Tableau Museum. You’re in fifth grade. It’s the day before school lets out for winter break. You’re excited about the holidays, the forecasted winter storm and no homework for two weeks. But before you can go, your teacher makes you stand in the hallway — perfectly still, perfectly silent — while your peers file past. Sound like a tall order? Welcome to the annual Rockville Elementary School Tableau Museum. We spent a lot of time covering policy here at StateImpact. I was in Rockville Thursday looking at the state’s A-F letter grade system. But when Principal Jeff Eslinger asked if I’d stay another hour “to see something special,” well, you can’t say no to that. 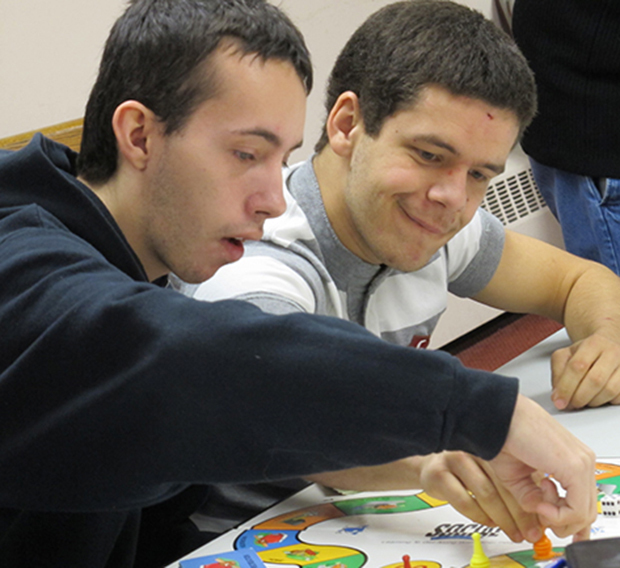 Tori Tackett, 20, plays a board game with another student in the CHOICE program, an initiative of the Northeast Indiana Special Education Cooperative. No Indiana school district stands to lose more than 3 percent of its overall revenues if President Obama and Congressional leaders fail to reach an agreement before a looming budget deadline. But if Indiana schools were to lose the estimated $114 million in federal K-12 education funding at stake in the so-called “fiscal cliff” debate, programs for some of the state’s most vulnerable student populations would feel a deeper impact. That’s because dollars underwrite services for special education students — and by law, local districts must still fund those services even if those dollars fall victim to the automatic spending cuts coming at year’s-end. A large crowd of parents, educators and advocates packed the State Board of Education’s meeting in Indianapolis on Monday morning as the executive panel met to consider a broad package of changes to Indiana’s teacher licensure guidelines. The proposal, known in shorthand as REPA II, has been controversial, as we’ve written. Supporters say the provision offers more flexibility in who gets licensed while still allowing schools to decide what teachers get hired. Opponents say REPA II “de-professionalizes” teaching by de-emphasizing training prospective educators receive in colleges of education.